I have always been a fan of the A-line skirt, and I've been tinkering with that high-waisted trend that I'm dangerously close to missing out on entirely, so here it is - the cowboy shirt turned high-waisted A-line skirt. Here's the skirt I drafted using a basic A-line pattern. I used a formula that I was taught at a library workshop, but to be honest it fits quite snugly, i.e., I can't eat much more than a few celery sticks in it before it feels like I'm going to pop a button, and I've had better luck just eyeballing it and drawing one up based on an existing skirt that fits me well. The best thing = no hemming! No buttonholes, either, except for at the new waistband. Wahoo! 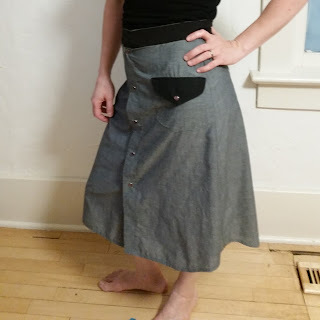 I may take that waistband down an inch or so and make it a bit looser, just to give myself some more room, but other than that I was pretty happy with this one. 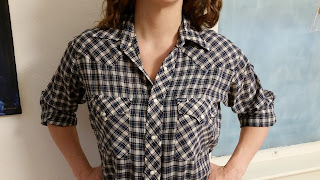 I love turning shirts into skirts because you don't need to hem! 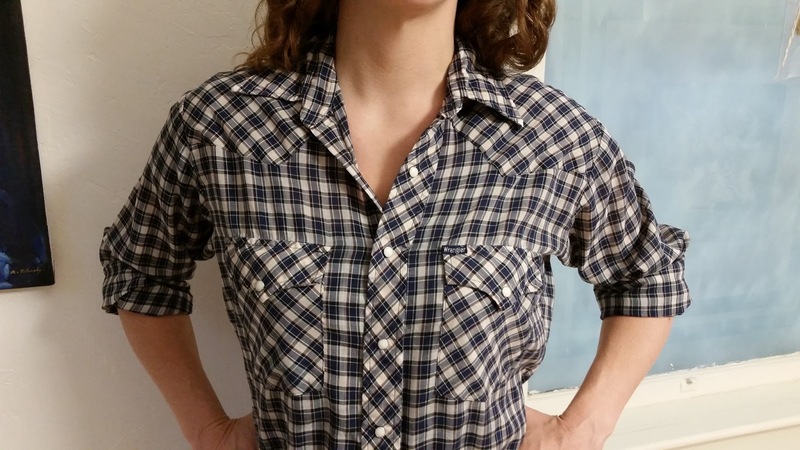 I've also made the waistband a little too big or too small, but that can be fixed with a few nips and tucks. I love the skirt. Great job. Sometimes the little sessions you would get on a workshop really only gets you the basic sloper/toile which you then build styles on. To make it really work for wearing, you have to add wearing ease. I had the same issues with an evening workshop a lady was doing. Yes, it fit, but I couldn't do anything in it. Later I did the whole City and Guilds pattern making and realised she was trying to fit something like a 2 or 3 year programme into one year! So, she didn't go on and help you know what to do with this fits-like-skin pattern. I can't imagine trying to do more than the very basics in a library workshop.